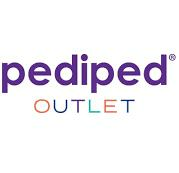 pediped® Outlet offers high-quality pediped® shoes at a fraction of the price! With prices up to 50% off pediped.com prices, pediped® Outlet offers an exceptional value in children’s shoes. pediped® Footwear has been awarded the American Podiatric Medical Association Seal of Acceptance and has received numerous industry awards and accolades including a 2016 Earnie Award from Earnshaw’s magazine as the Footwear Brand of the Year and the 2015 Footwear Industry Award as the Children’s Footwear Brand of the Year. Offering of more than 120 designs for boys and girls between its three lines, Originals®, Grip ‘n’ Go™ and Flex®. pediped® Outlet’s award-winning styles are available in sizes Newborn to 6 Youth.